Home | Posts tagged "limestone"
Lithography is a printing technique through the use of a limestone plate . The main component of this type of stone is the calcium carbonate, which has the property of changing in surface its chemical composition in contact with acids, and easily accommodate the fatty substances. Due to this property, you can create areas with different physico-chemical properties on the surface of the stone: hygroscopic, which attract and hold the water, but repel greasy-resinous inks; fatty, which repel water but retain inks. To prepare the stone matrix, you can use two methods: the chemical one and physical one. Among the others, the techniques of pencil lithography or brush lithography belong to the chemical method; engraved lithography and embossed lithography belong to the physical method. In this article I will deal only the techniques that I have personally used to produce my works. Initially, the stone is smooth and cleaned by wiping it with another stone, once you have beveled the corners. Once it is dry, we proceed by drawing with a pencil or a lithographic crayon directly on the stone. In this way you will get the prints very similar to pencil drawings, with shading and chiaroscuro. Once the drawing is finished, you should dust the surface of the plate with fine talc and skip to the etching of the matrix, stretching out on the entire stone a solution of arabic gum and acid with a broad brush and letting it dry for at least 12 hours. The next steps are washing the acid away from the stone and spreading a thin layer of arabic gum to protect the parts of the stone that will remain white. With a solution of turpentine and oil you check the areas of the matrix drawn with the pencil or the crayon, removing them, and you pass a thin layer of “litofina” (a mixture of tar and turpentine), which, penetrating into areas previously drawn, makes them even more fatty and therefore easily inkable. 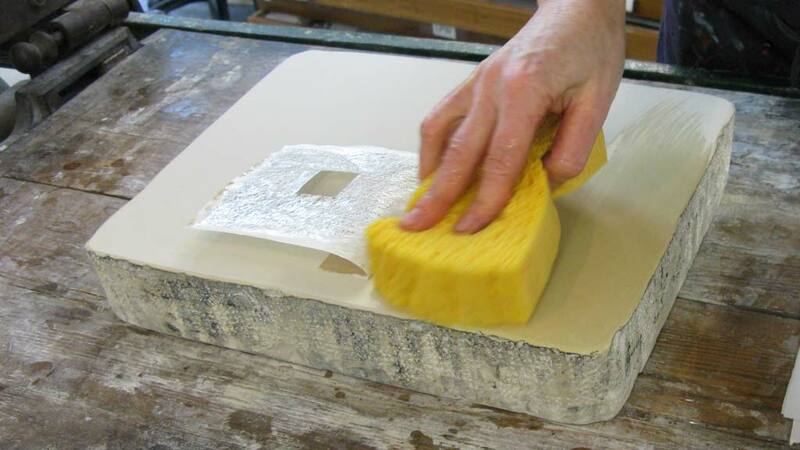 After it has dried, you dust with talc, making the stone a matrix ready to be printed with a lithographic press. In the brush lithography technique, the preparation of the stone is the same as described above, with the difference that the drawing is made on the stone with a brush and with the lithographic ink. To obtain various color shades, it is appropriate to dilute the ink some water. In this way, the array will report on the lithographic printing an effect very similar to a painting, with the gestures and the variety of signs that this could give. To get a good variety of tones, from the lightest to the deepest black, the stone should be treated with a neutral soluble salt. The rest of the processing of the matrix is the same as described above for the crayon or pencil technique.